Please check out my daughter’s shirt. The little heart wheelchair shirt has been passed along first by two brothers, then to our son and daughter, and we will send it along to the child of another friend who is a parent living with a spinal cord injury. 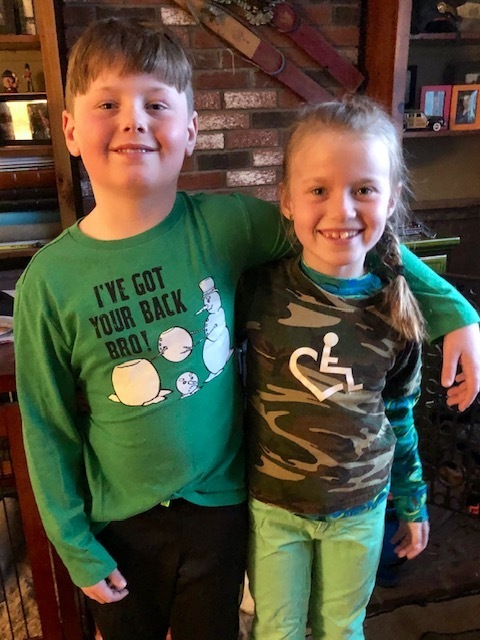 The shirt was selected to accompany the St. Patrick’s Day Theme Color, but it’s really just one little metaphor of all the connections we’ve made since Geoff’s spinal cord injury. My son’s shirt is equally adorable, “I’ve got your back, bro,” and so many people in this world of SCI have our backs too. Another example is Reeve Connect,people connecting with people and resources. When you first log in, you will receive this email with an explanation of how the groups work along with different categories including: newly paralyzed, new normal, health and wellness, relationship, WAGS of SCI, and What Works. The email ends with this closing paragraph, which not only persuaded me, a veteran in the world of spinal cord injury, to visit the community, but also to contribute to it. I’m generally the one in my life–or my husband Geoff– whose names are given out as resources when someone is recently paralyzed. But neither of us certainly knows all there is to know about spinal cord injuries; we know our world but that can be very different for someone else. So, there I was checking out RESOURCES that I should learn more about when I came across WAGS in the community group. Women and Girlfriends of Spinal Cord Injuries. I had heard about this group years ago and giggled wishing that I had come up with that name. So this cool thing happened, that despite me feeling like there wasn’t a lot for me to learn or contribute to as an “expert in the field” I found myself wanting to return to Reeve Connect each night to see what words or questions or posts new people had written. For example under the home page for relationships, there was this great post called “Managing your guilt about everything and anything” by Dr. Dan Gottlieb. I read it once and then a second time, and then I read all of the comments below the thread, and when I got to the one by WAGS, I took a really deep breath. Geoff has been traveling for two weeks in Bulgaria for work, and as much as I love and miss him, I do NOT miss taking care of him. There I said it. I said it out loud, and I feel pretty awful for saying it loud. But his travel allowed me to take time for me and not be a crazy maniac in the morning yelling at my kids to get ready before school. I’m wondering if I should put that in the Reeve Connect under that thread. Or, does that just make me look like a terrible person? It may to some, but I’m guessing that is a very real feeling of guilt for a lot of people like me. I recently shared Dr. Gottlieb’s post with a friend who cared for a family member for a long time, and that person has since passed away. He feels guilty for having time again and being able to choose what to do at that time. But that thread helped him too. That thread in Reeve Connect validated feelings which needed validation. I can’t wait for Geoff to come home. But it’s also okay that I got to have some time without him. Thank you WAGS! Thank you, Dr. Gottlieb! Thank you to everyone else who has begun to weigh in at Reeve Connect. Thank you Reeve Community for developing this forum, and thank you to our own community for our endless support.